I will be attending a combined District Installation meeting at Lodge Te Papa In Tauranga. This meeting will be a full board. The Dis G Masters from Bay of Plenty Waikato, Counties Manukau, Auckland and myself will all be participating in the ceremony. I have not bothered advertising this widely because of the Inability of many of our Grand Lodge officers to travel at the present time. I will be supported by a couple of Brethren who are able to attend. We will be presenting a 50 yr Jewell to Bro Owen Mitchell at Lodge Hatea. This will be Grand Lodge visit and I would request as many GL officers and other Brethren to attend if at all possible. Ladies are invited The dress code will remain as Lounge Suit as the weather is still very warm. Brethren please note that Ladies are also welcome. We will be holding the Installation practice for Lodge Hikurangi at the Lodge rooms in Hikurangi. 7pm. Our first Installation for the year at Lodge Hokianga. As advertised the regular meeting will tyle at 10.15am, with Installation practice at 11am, Visitors 12.45 and Grand Lodge 1.30pm. Ladies are most welcome as usual. Brethren contrary to belief this meeting will be held on Saturday 4 May 2019 at the Albert St Lodge rooms in Whangarei. It was deemed to difficult for the number of visitors travelling from Auckland to get to Kerikeri for an early start. When the draft agenda is confirmed I will send it Northland Wide forthwith. Please note that the District meeting will start at 9 am with tea and coffee and we will try to finish the Dist meeting by 10.30am. Brethren, please NOTE the following District meeting will be held in Kerikeri on Saturday 3 August 2019. We all ask where has this year gone, and always faster than the last. With this report, the last for 2018 Judy and I bring all the best from us both. All those people and lodges who have supported us over the past year I thank you and I look forward to working with you all again in 2019. For me, It has been for me one of the busiest years or work and Lodge duties of my life. I have assisted a number Lodges and members in sorting out problems for them during the last twelve months and in most cases this has been a great pleasure. The results have been most rewarding and gratifying for me and thoroughly appreciated by those Lodges. An example of this was the great result we achieved on the refurbishment of the hall and Lodge rooms for Lodge Hokianga in Rawene. The function we held a special meeting for the celebration of these works which was attended by the Master and some members of Lodge Manukau Westmere, the Lodge who facilitated the funding for this project. Once again thanks must go to MW Bro Mark Winger GM, and the members of Lodge Manukau-Westmere for making this project possible. We have had a couple of Charity highlights in the last month that I have knowledge of. Through Lodge Whangarei and the Freemasons Charity, we have been able to support the Maungakaramea Primary School with an updated Library computer and system that allows students to borrow books at any time. This will allow them to search for resources via a web browser, look up a book, order a book, access print and other digital material. It has been a pleasure to work alongside this school for the benefits of the children. Many thanks to Lodge Whangarei No 102 for their monetary assistance on this project at very short notice. As some of you may be aware we have not had an official Benevolence Officer since the resignation of Bro John Foster. I have been filling this position, very ably assisted by my wife Judy. We are still in a situation where it would be most appreciated if some Brother who has the time and the ability to take over this position to contact me. The other Charity Project arises from the Annual Masonic Bowling Tournament, where I had the pleasure of presenting 4 Ipad’s to the CEO and Senior Pilot Peter Turnbull of the Northland Emergency Services Trust (NEST) These Ipad’s were presented at a very timely moment as the wiring and placement of the Ipad is not far away. The two new helicopters are due for commission in March 2019. The electronics are being modified, extra equipment is being fitted to facilitate their use as Rescue helicopters, and both machines are being modified at this moment. The Ipads will be installed one each side of the main dash panel, both are considerable larger than the central in dash computer screen. The IPads will give them the ability for much larger screen display, which will now be able to be split between the Pilot and Co-pilot. They will be blue toothed to the main screen allowing far improved access for both pilots. NEST are very humble that the Freemasons through the Annual Bowing Tournament and the Grand Lodge Charity are able to be so charitable to their Trust. It is worthy of note that this was the 50th year of the Northland Masonic Bowling Tournament. This being the longest running and most successful fundraising project that our district has ever seen. The tournament once again, was most well patronised, supported by our Ladies and a few members and my thanks must go out to W Bro Harry Gray and his very able committee and team for once again putting together this most successful day. V W Bro Kevin Burch Dist GM presenting the 4 Ipads to CEO and Senior Pilot Peter Turnbull at the Annual Bowling Tournament 27 Nov 2019. Judy and I wish would like to take this opportunity to wish you all the very best over the festive season. As always take care if you are travelling and we look forward to seeing you again in 2019 or before. I will combining the two months of Oct and November into one message this month. I have waited until the last two installations have been competed for the year. On 27th August I had the pleasure and honour of travelling to Apia to Samoa, with several Auckland G Lodge officers where we installed W Bro Colin Stinger into the chair of Lodge Calliope 252. R W Bro Murray Morrissey officiated during the Board assisted by V W Bro Peter Goodwin, History, V W Bro Bill Planer GDC for the ceremony. A very hospitable time was held by all if us, a great bunch of locals, new friends made and old friendships rekindled. Jude and Daughter sons in law and grandson accompanied me. After Lodge festivities we travelled to the northern island of Savaii and enjoyed a fantastic family holiday at Stevenson resort. This resort is managed by their lodges new EA, Courtney Stevenson. Many thanks to all the Brethren for their fantastic hospitality. Talking about returning next year. We all enjoyed a great night to welcome W Bro Gary Best into the Masters Chair at Lodge Kerikeri on Tuesday 9 Oct 2018. I know Gary will be supported by the dedicated and experienced team that has been before him. Of note W Bro Gary’s name was forwarded to me a few years ago by Grand Lodge Office after he was unable to make a contact in the Bay of Islands area. W Bro Gary was initiated in London and was a member there for several years before immigrating to NZ. At the time I made a couple of phone calls and put him in contact with V W Bro John Campbell P GDC and now I have had the pleasure of installing him as their master. On Saturday 13th we travelled in Lodge Kororareka at Russell to Install W Bro Robert Goodhue into the chair. It was certainly a change to have a meeting at the RSA, as the Building that the Lodge had held Installations in for many years was sold. Everything worked well although quite cosy a very good turnout of younger members, Great support and they look forward to being able to increase membership and strengthen the struggling Lodge. Sat 27rth October we are holding a very special celebration on the presentation of two 50 yr Jewells for V W Bro Bob Vartan P Dist GM and V W bro Ron McCracken P GDC. Many guests are coming for from and near to celebrate this occasion. We look forward to seeing some of you there. On Sat Nov 10th a good number of us will be attending a special meeting at Rawene to celebrate the refurbishment of their Lodge Rooms in conjunction with Lodge Manukau Westmere, as it was their old building erected in the 1880’s and barged to Rawene up the West Coast and re-erected in the 1980’s. Registrations forms have been delivered to every Freemason via the NZ Freemason magazine. Additional forms are available from National Office should you need one. It does seen a while away yet but some forward planning may be necessary to attend this triennial event. District meeting proposed date Saturday Nov 17th. TBC prior to Northland Conclave No 7 meeting. On Tuesday 16 October, W Bro Lindsay Stichbury P Dist GDC and the current Supreme Ruler of Northland Conclave No 7, Christine his wife and Judy and I had the pleasure of presenting a cheque for $5000 to “Kind Hands” on behalf of the Northern Youth Assistance Trust from the Northern area of the Order of the Secret Monitor. This is the first time for many years that Northland has benefited from by way of a Grant from this Trust. This Donation will assist in the care and treatment of six children for the next few months. This was most satisfying for me personally as I have been a member for over 35 yrs. Kindest and warm regards for now. Please find below the meetings that have been loaded so far onto the Freemasons website for the month of September. Okara Daylight Lodge No 461 takes place on Saturday 15 September 2018. W Bro Graeme Bell will be installed. He was last in the Masters chair in 2015. The Lodge resumes at 12.45pm with visitors at 1.15pm. Your attendance would be most appreciated to support W Bro Graeme Bell and the Okara Daylight Lodge. Judy and I will be away until Thurs 6 September and will leave the District in the capable hands of W Bro Trevor Hall. Should any matters arise then he is able to contact me. Many Special thanks to those that have been able to help out with any sewing, knitting and toy making for the District Project “Kind hands”. Sharlene is very humbled and very appreciative that we stand alongside our men and also help in other ways. Yes we are still beavering away and we plan to do the next drop mid-November to Sharlene of “Kind Hands.” If you have any goodies to donate and they are in the way please just give me a call. I wil be in touch before we give our next bundle to Sharlene. If you need clarification about what to make please give me a call. It brings me great pleasure to give you this August report. I begin with a slightly different format as I am hoping Brethren will see the workings around the District first and foremost, so that if at all possible they may attend any meetings and Installations to support other Brethren, new Masters and Installations. 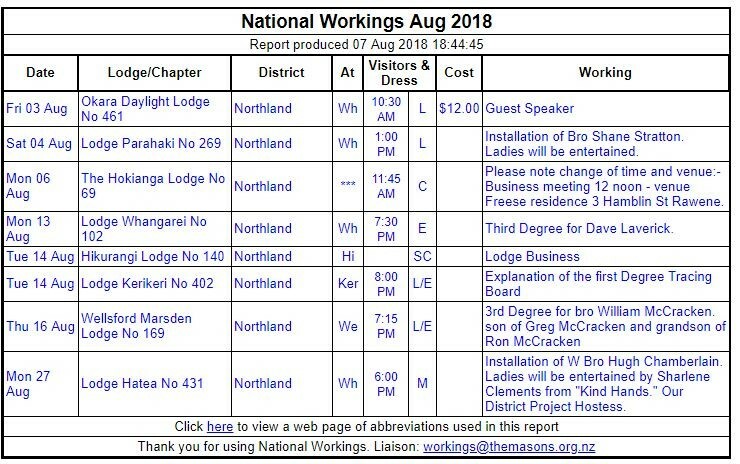 So here Brethren are the meeting dates and workings for the month of August in our Northland District. Please make every effort to attend wherever and whenever you may be able to. Lodge Hatea – Monday 27 August. The tyling time is 1 hour earlier at 6pm. where W Bro Hugh Chamberlain will return to the chair. Your attendance would be most appreciated to support W Bro Hugh. Early on the 28th August Judy and I fly to Samoa where I will officiate at Lodge Calliope’s Installation later that week. I will be accompanied by a few Brethren form Auckland, W Bro Bill Palmer, GDC a member of 102, and several Auckland G Lodge officers. This Page is just for you to read. Gentlemen, please print this off for your Ladies or please make sure they read this. A special thanks to these Ladies who have been able to donate all the goodies give to me over the last month. The items have all been donated to Sharlene at Kind hands and she is very grateful. This is of course is ongoing for some time yet and I am still able to take any donations to her as they come to hand. Many special thanks once again for you support and as always just give me a call if you are able to help going forward. It brings me great pleasure to give you the July report. Despite the cold snap, I wish you all the best for the start of winter. So here Brethren are the meeting dates and workings for the month of July in our Northland District. This month sees another format as my wife Judy, has an important announcement for all the ladies in the District. Please Brethren make sure you Ladies see Judy’s page as I am sure you will agree they do support us whenever they can. This can be found at the end of my report. June saw just one Installation that of Lodge Wellsford Marsden where W Bro John McDonald went back into the chair. R W Bro Gary Salmon, our Divisional Grand Master honoured us with a visit on this occasion. A great evening was had by all, however numbers were down a little, due to a misunderstanding over numbers required. It is very encouraging to see this lodge in great heart with numbers slowly increasing and more in the pipeline. Last Saturday we travelled to Auckland Lodge Ara 348 Irish Constitution on the occasion of their 176th Installation. This is always one of the largest Installations in the country. Their hospitality and ritual is unsurpassed. This is well worth attending for any Brother who has not been there before. We have also been successful in gaining a Grant to renovate and paint the interior of the old Lodge room in Rawene. This work we hope will be carried out in the near future. Many thanks to our Divisional Grand Master and Grand Master for their assistance in helping us to secure the required funding. We are also very pleased to announce that the Grant of $5000 from the Grand Master s project fund has been approved to assist with our District project, “Kind Hands.” It is very humbling to see that several of the Lodges have already come aboard this project and pledged their support with very healthy donations. Thank you to those Lodgs who have had meetings and supported this project. With a couple more meetings ahead, I am sure we wil have the full support from the region as a whole. Lodge Hikurangi – Tuesday 10 July with W Bro Ivan Berryman returning to the chair. Brethren please give your support to Ivan and the Hikurangi Lodge. They are struggling for numbers and any support would be most welcome. Lodge Kaikohe Ohaeawai - Wed 25 July with W Bro John Anderson returning into the chair. As always it is most appreciated when you able to attend. We all well realise this is probably a cold night out, however I am sure the hospitality will be very warm and hospitable, along with the car heater on the way home. This is the first time I have written to you in conjunction with Kevin’s report. First of all , I thank you for all the support you give, never mind how much or how little to your men folk, to the community and to others in need under the umbrella of Freemasonry. It is truly appreciated. For quite a while now I have been trying to think of a project we can get involved with as the men raise/donate funds for a District Project called “Kind Hands.” We now have the perfect opportunity to show we care just as much. A Grant of $5000 from the Grand Master has been made available and after Kevin’s announcement at a District meeting and the Lodges endorsing his idea “Kind Hands” was the chosen project for the Northland District. “Kind Hands” is a respite care cottage for medically fragile children aged 0-6 yrs of age. Children fitting a certain criteria will be cared for at the cottage in Whangarei, coming from all over Northland. This cottage is the inspiration of Sharlene Clements, who has been a paediatric nurse for over 23 years and during this time has seen parents exhausted and have very little support available to them while looking after their fragile baby or child. “Kind Hands” has always been a dream of Sharlene’ s and now along with her husband, who has been building the home/cottage it is coming to fruition. Please see today’s picture below. The $5000 grant from the Grand Master will used very wisely for equipment and resources. We are unable to pay salaries. I am therefore asking if anyone is able to knit, sew or create anything for 0-6yrs old girls and boys. This could be in the way of any knitting or sewing for babies, i.e. beanies, bootees, cardigans, socks, cot blankets, cot quilts, and single bed throws, in fact anything you chose that you may like to make to help the children while they stay the cottage. As they open on the 28 July, it would be lovely if we would be able to get a small bundle to give to on or just before Opening day. I would envisage a first bundle of goodies to go to Kind Hands around opening time and then perhaps another one in 2 or 3 months’ time. If you would be able to give me an indication of how you may be able to help, that would be most appreciated. I can then let Sharlene know we have some goodies arriving. I feel passing on your gifts to Sharlene as one package from you all would be a great boost to start this project off. Ladies your support with this is most appreciated and I thank you in advance. I would love to hear from you if you have any other suggestions. Our email is kjburch102@gmail.com and my phone is 09 438 9023 or 021 318 700. I do hope to hear from you soon. As our mild weather continues I wish you well. Last evening we installed W Bro Roy Scahill into the Chair at the Mangonui Lodge No 78, in the Kaitaia Lodge rooms. This was an historic day for the Northern District. Roy has much enthusiasm and both he and Kathy are very passionate about his Lodge making headway in the year ahead, especially with the prospect of increasing their membership. They will be meeting 4 times a year at different Lodge rooms throughout the district. Congratulations to The Mangonui Lodge No 78, now becoming a travelling Lodge. Look out for W Bro Roy and his Brethren popping up somewhere soon. Late last month and after my last report went to print, we were advised of the passing of Wor Bro Ray Holland at his home in Mangawhai. Ray had resigned from the craft a couple of years ago due to poor health and not being able to attend he will be sadly missed by both family & the local community. Our condolences to Jan and the family. Wed Sat 25 April W Bro Trevor Hall and I attended the ANZAC service and laid a wreath on behalf of the Freemasons of Whangarei and surrounding District. Thank you to those Lodges and Brethren who were able to make a contribution toward the cost of this wreath. A very cool morning, no rain and a great turnout from all of the city groups. On Thursday last Wor Bro Trevor Hall & Wor Bro John Farley accompanied me to the Installation of Wor Bro Len Field at Lodge Franklin 2138 EC, where I presented the signs of an Installed Master, in the NZ constitution. This Wednesday the 2nd May I will also be representing the NZ constitution at Lodge Rodney in Warkworth, any Brethren wishing to come and visit our sister constitution, give me a call & we will arrange transport. Upcoming Dates for your Diary. I would welcome anyone to accompany me if at all possible. I am visiting the following Lodges in May. Sat 12 May Northern District Trust Bd Mgt Hobbies Hall, Maunu. 9.30am for 10.00am. This Installation will be a full Board, NOTE we are starting a little earlier because of this. Wed 23 May Lodge Kaikohe/Ohaewhai 101 1st Degree for Identical Twins – Selwyn and Dion Gregory. The Grand Master M Wor Bro Mark Winger is attending this rather special ceremony and very special for him as well having been born in the Kaikohe area. The Deacons are a couple of similarly identical twins no prises for guessing who, should be an interesting evening. Last weekend a small number of Northland Members attended the Divisional Conference in Auckland, a rather disappointing response from our Northland Masters & Brethren. This is a time when we all get a chance to meet up with old friends, make new ones & have a chance to have your say in the running of our organisation, represent your lodge and most importantly vote on any remits which may concern us. To those Brethren and Ladies who are not well at the present time, Judy and I wish you a speedy recovery. Brethren, if anyone knows that a Brother or his wife /partner is unwell or in Hospital can you please inform your Almoner who will in turn pass on the information to me. We are already to help and support where we can, however we need to know when members are unwell. It gives me great pleasure to give you the June report. Over the 18 months I have been looking over suggestions about how we would best utilise the Grand Masters grant of $5000 for all of the Northland District. At the District meeting I tabled a propsal about "Kind Hands" which is a project which would benefit all of the Northland District and we had over whelming support from all Lodges represented. I then sent the details through the Northtalk to all secretaries to distribute to all Northland Members. We have had several favouable comments from members but are awaiting written support from our Lodges. Please Brethren give this your urgent attention and I await your confirmation so as we can move forward with this most deserving project. I enclose some background of the “Kind Hands” respite cottage details in Whangarei. “Kind Hands” is a Respite Care Cottage for medically fragile children and babies aged between 0-6 years. This cottage is the inspiration of Sharlene Clements, who has been a paediatric nurse for over 23 years and during this time has seen parents exhausted and have very little support available to them while looking after their fragile baby or child. " Kind Hands" has always been a dream of Sharlene’ s but up until now she and her husband haven’t been able to afford to build it, they have taken a bank loan to finance the building, which is nearing completion and hope to open by the end of July. The building at this stage is fully enclosed, exterior and roof completed, interior walls in and most decks completed. This building has a fully functional Type 7 sprinkler system and all the other requirements up to Hospital standard. “Kind Hands” will benefit the whole of Northland as they will take referrals from Wellsford to the far North, and they will endeavour to give all families the chance to utilize “Kind Hands” in the way that best suits their needs. Some of the conditions the children have could be: they are born early, have a heart condition, diabetes, on home oxygen, failing to grow, cerebral palsy, ACC referral, palliative conditions and many more. Their aim for the future is to be funded and they are also in the process of setting up a trust that will work alongside “Kind Hands” to be able to offer a bed back to the community for those who may not get any funding or just “don’t fit someone’s category”. They don’t want to turn anyone away. The $5000 grant from the Grand Master wil cover equipment and resources enabling the Cottage to open fully equipped and ready to operate, hopefully be the end of July. This is the first step in the Plan. This plan has been forwarded through to the Div. Grand Almoner for his assistance and I have been advised that the Freemasons Charity may also be able to help after the Cottage opens. The District project would then be seeking funds from the Northland Lodges and then applying for a Grant through the Freemasons Charity Fund would be the best option. May has been an extremely busy month representing Grand Lodge at the Rodney Lodge No 1711 EC in Warkworth. Although their numbers are well down, the hospitality is always exceptional with representatives from the three sister constitutions. A great night was had by all. I was able to resent the outgoing Master, W Bro Bob Fricker with a copy of his Uncles Installation programme, when he was installed in the chair of Lodge Whangarei No 102 (my own Lodge) 70 yrs ago in 1948. Sat May 5th I had the honour and privilege of accompanying a team of Grand Lodge officers to the Installation of Bro Bruce Wiig at Lodge Manurewa No 222 in Papakura. His twin brother, V W Bro Bryan Wiig was given the honour of installing his older twin (5 mins) into the Chair. We had an exceptional turnout with 100 brethren in the Lodge room and I had the Honour of being received by no less than 55 Grand Lodge Officers. A very humbling experience for me. A most memorable night for Freemasonary. On May 14th I had the pleasure of Installing Bro Tim Telfer into the Chair of my own Lodge Whangarei 102. A special pleasure for me as I interviewed Tim and seconded him into the Craft just a few years ago. He is one of the youngest Masters that we have had for many years. 23rd May we had the honour of receiving the Grand Master, M W Bro Mark Winger, visiting our District, on the occasion of a 1st degree ceremony, for 21 yr old identical twins, Selwyn and Dion Gregory. Assisting with this ceremony were 71 yr old Identical twins, V W Bro Bryan and W Bro Bruce Wiig (the Master of Lodge Manurewa. Who carried out the duties pf the Deacons. A rather unique ceremony. The Grand Master presented the charge after initiation. As usual with our far north lodges the hospitality was incredible and a great evening was had by all. On a sadder note, several of our Brethren attended a Memorial service at Kerikeri for our late W.Bro Keith Ashcroft, who passed away recently aged 93. A very well loved Brother and a true gentleman. 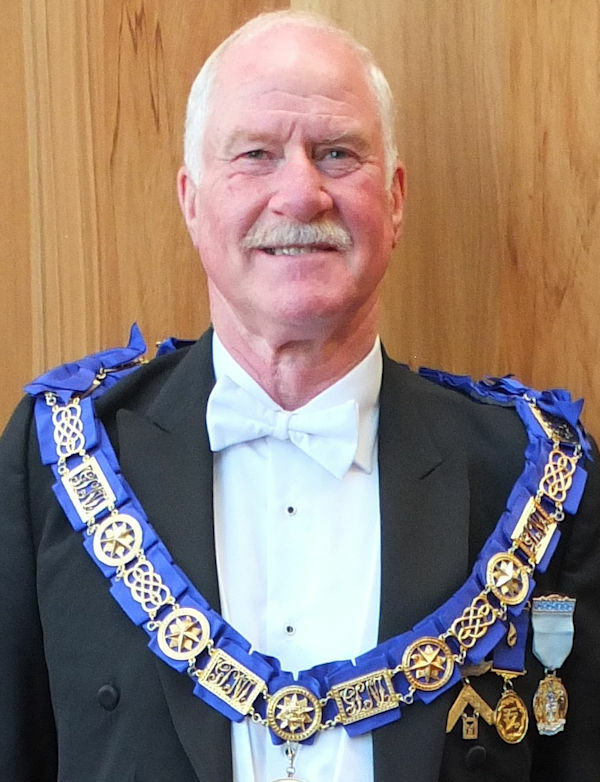 He was a Past Master of Lodge Kerikeri and a Past Depute First Grand Principal of the Royal Arch Chapter of NZ. Our condolences to the family. This month things wil be a little quieter with one Installation at Lodge Wellsford Marsden No 169 on Thursday 21st June, where W Bro John McDonald our venerable Northtalk (Sorry North News Editor) returning to the chair for a second term. The work allocation for Grand Lodge officers has been distributed. As usual please advise with plenty of time if unable to attend.